An aurora sometimes called “polar light” is a natural light display in the sky, seen in the high latitude in the two poles: Arctic and Antarctic. The aurora is actually collisions between electrically charged particles from the sun that enter the earth's atmosphere. The lights are seen above the magnetic poles of the northern and southern hemispheres. 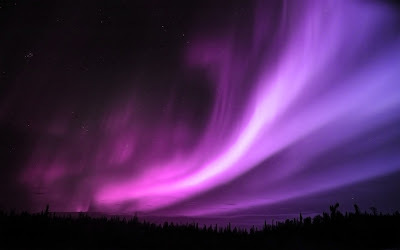 They are known as 'Aurora borealis' (meaning -'dawn of the north') in the north after the Roman goddess of dawn, Aurora, and the Greek name for the north wind, Boreas, by Galileo in 1619 and 'Aurora australis' (meaning - 'dawn of the south') in the south has features that are almost identical to the aurora borealis and changes simultaneously with changes in the northern auroral zone. It is visible from high southern latitudes in Antarctica, Chile, Argentina, New Zealand, and Australia. But why auroras are most likely to be found at the poles of the planet? The North and a South Pole of the earth are Just like a bar magnet. The magnetism at the poles reaches all of the way down into our planet’s core and the particles follow an invisible magnetic line down the poles. Since the magnetic and geographic poles aren't the same, sometimes the auroras are visible farther south than one might expect, while in other places it's farther north. The Earth’s atmosphere is made of two main gases called oxygen and nitrogen. Both of these gases are made of the molecules and when they collide with the particles thrown out by the Sun, they emit the colors that turn the darkest of skies into a beautiful light show. The lights appear in many forms from patches of light to streamers, arcs, shooting rays that light up the sky with an eerie glow. Aurora appears in many colors like pale green and pink and also sometimes shades of red, yellow, green, blue, and violet. Variations in color are due to the type of gas particles that are colliding. The lights of the Aurora generally extend from 80 kilometers to as high as 640 kilometers above the earth's surface. 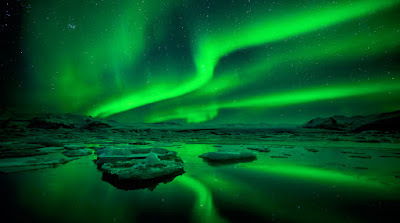 A full understanding of the physical processes which lead to different types of auroras is still incomplete, but the basic cause involves the interaction of the solar wind (The solar wind is a stream of charged particles released from the upper atmosphere of the Sun) with the Earth’s magnetosphere. In other words, the temperature above the surface of the sun is millions of degrees Celsius. At this temperature, collisions between gas molecules are frequent and explosive. Free electrons and protons are thrown from the sun's atmosphere by the rotation of the sun and escape through holes in the magnetic field. Blown towards the earth by the solar wind, the charged particles are largely deflected by the earth's magnetic field. However, the earth's magnetic field is weaker at either pole and therefore some particles enter the earth's atmosphere and collide with gas particles. These collisions emit light that we perceive as the aurora. Many cultural groups have legends about the aurora. 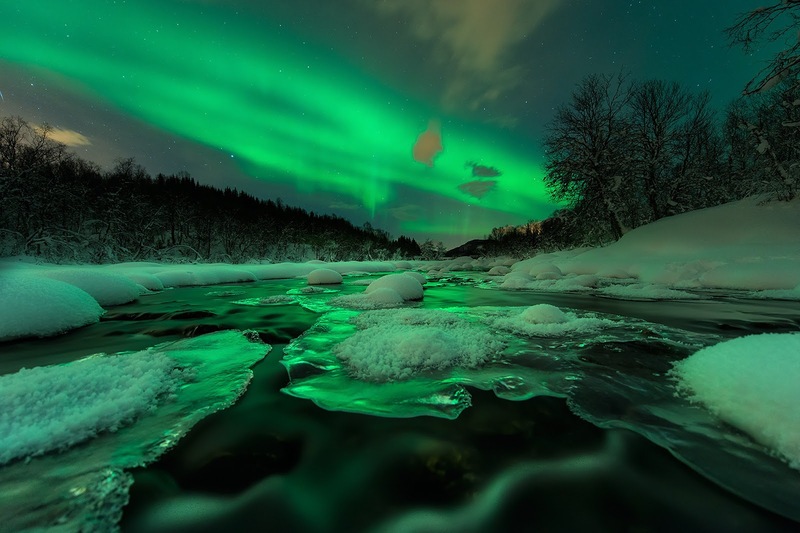 In medieval Europe, the auroras were commonly believed to be a sign from God.The Maori of New Zealand shared a belief with many northern people of Europe and North America that the lights were reflections from torches or campfires. The Menominee Indians of Wisconsin believed that the lights indicated the location of giants who were the spirits of great hunters and fishermen. The Inuit of Alaska believed that the lights were the spirits of the animals they hunted: the seals, salmon, deer and beluga whales. Other aboriginal peoples believed that the lights were the spirits of their people.